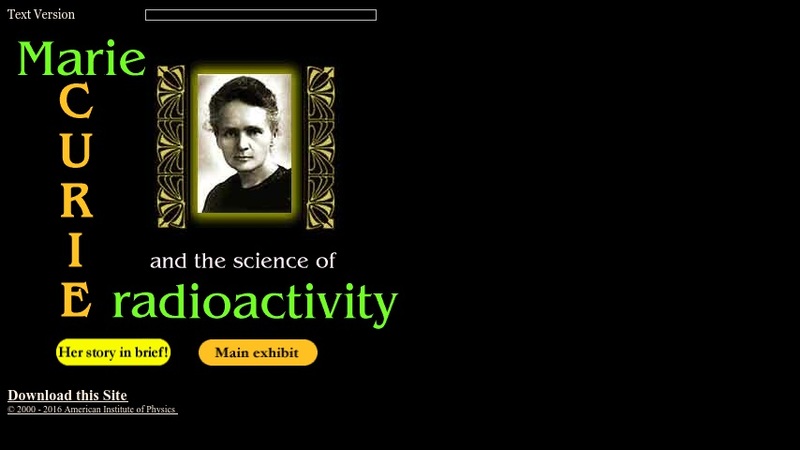 This digital exhibit explores the life and accomplishments of Marie Curie, the Nobel-Prize winning physicist who discovered the radioactive elements polonium and radium. The exhibit integrates primary source lab notes, diary and journal entries, and historic photos to give a poignant view of Curie's struggles: growing up in the Russian-controlled Poland of the late 19th Century, being the target of repeated discrimination during her higher education in Paris, working with radioactive materials in substandard lab conditions, dealing with the consuming grief of her husband, Pierre's, accidental death in 1906, and overcoming challenges to win two Nobel Prizes. Editor's Note: It can be difficult for students to appreciate science as a human endeavor. This resource was designed to help learners grasp the hardships and obstacles often faced by pioneering scientists, especially women and minorities. Just as important, it gives them a glimpse at the joys of discovery. For a simulation on the same topic, see Related Materials: PhET Alpha Decay, which contains a very good accompanying lesson plan for high school teachers. Analyze the author's purpose in providing an explanation, describing a procedure, or discussing an experiment in a text, identifying important issues that remain unresolved.